The Children’s Cornerstone, Montessori Preschool and Kindergarten | Scranton, PA | A private academic school that offers students, ages 3, 4, 5 and 6 a learning environment based on Dr. Maria Montessori’s educational philosophy. 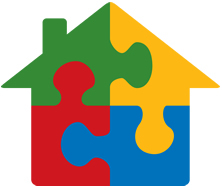 The Children’s Cornerstone, a Montessori Preschool and Kindergarten, was established in 1987. This private academic school claims no religious affiliation. Students are accepted regardless of gender, race, creed, or social status. Mrs. Dorothy M. Mariotti, M.Ed. The Children’s Cornerstone implements teaching and learning strategies based on the studies of Dr. Maria Montessori. Born in 1870, Montessori was the first woman to graduate from the University of Rome Medical School. She spent a great deal of time observing how young children learn. Montessori discovered that children possess a remarkable ability to absorb knowledge from their environment. She believed that by offering the learner an opportunity to explore and experience a “prepared learning environment” the educational process can naturally unfold. The Children’s Cornerstone provides a superior learning environment for the young child. Montessori’s studies revealed that each individual develops at his/her own pace with mark “sensitive periods” of development. The Children’s Cornerstone operates under this premise by offering individually based developmentally appropriate programming. It is the goal of this programming to assure that each child is given the opportunity to meet success emotionally, physically, socially and academically. Mrs. Dorothy M. Mariotti, M.Ed., strongly believes in the value of Dr. Maria Montessori’s methods. She knows that early learning experiences play a vital role in the formation of the young child. Research suggests that the impact of these experiences is felt well into adulthood. As instructional directress, Mrs. Mariotti’s assures that The Children’s Cornerstone provides a superior educational foundation not just for school…but for life! 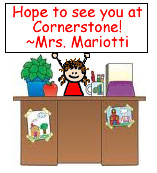 Mrs. Mariotti brings a wealth of personal and educational experience to the learning environment at The Children’s Cornerstone. She is a mother of 3 children with diverse interests and talents. By participating in the parenting and child rearing process, Mrs. Mariotti can “appreciate” many of the pains and pleasures that young parents are experiencing and will be facing in the years to come! Mrs. Mariotti completed undergraduate and graduate studies at Marywood University, Scranton, where she achieved honors recognition at both levels. She participated in specialized training in Montessori methodology with the well-renowned staff of the Center for Montessori Teacher Education at The College of New Rochelle, New York. Mrs. Mariotti holds Pennsylvania teaching certifications in Early Childhood Education and Development as well as in Elementary Education. By careful observation, Mrs. Mariotti will support the young learner in becoming an individual of personal excellence. Each child will be challenged to meet emotional, physical, social and academic goals. Through her support and encouragement each student will indeed meet success.